Technology is truly an amazing thing! Kevin and Reidster: Heavy Duty “Teching Out” on the train. 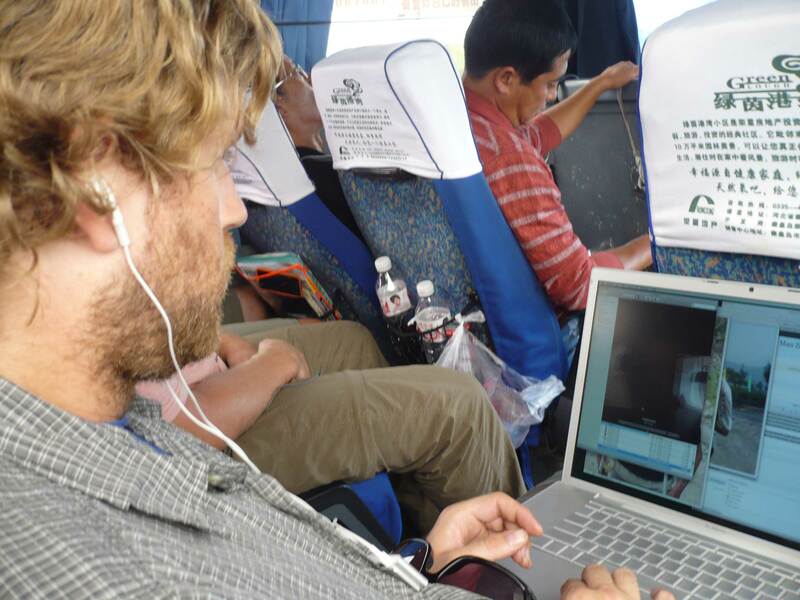 Right now I am writing this blog entry from the overnight train from Shanghai to Beijing, looking out the window as we rapidly pass by the landscape that took us a month to cycle through. It’s kind of surreal to think about really…First that we bicycled across this much land…and second that our trip is finally coming to a close. In one sense it’s a little bit of a relief, but in another sense I would love to have more time here. The country of China is so vast and complicated it’s kind of sad to think we will be leaving so soon with so much more left to explore, so much more to learn. But honestly, I think we all feel satisfied with our experience and have made the most of our relatively short time here, taking in everything that China has thrown our way (and more). 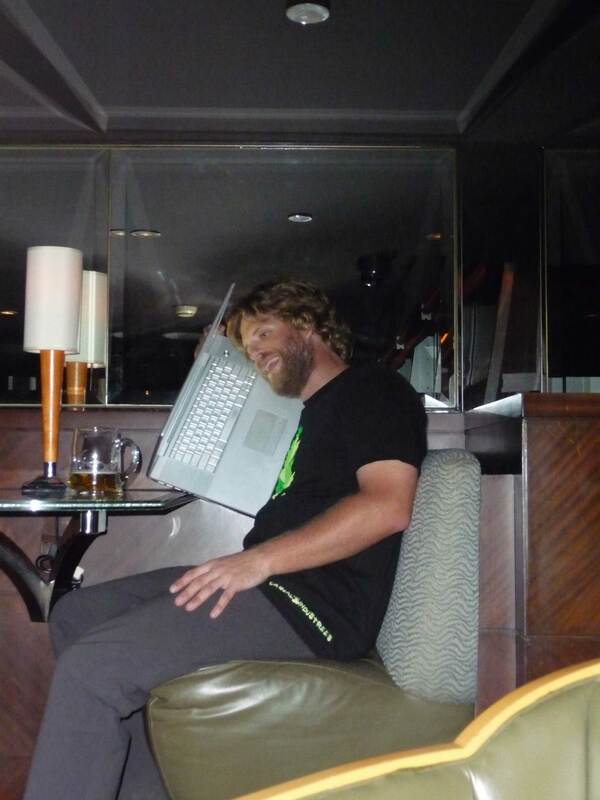 “Teching Out” in the hotel. Thanks Sealine for keeping all my electronics safe! Using my computer as a phone…Futuristic! 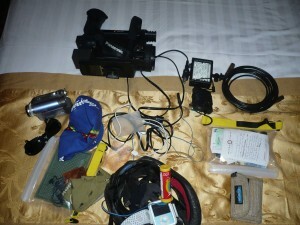 Team Man Zou: iPod Ready! 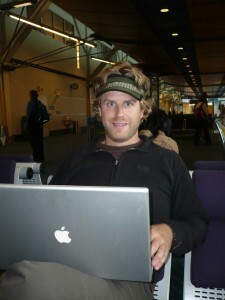 Anyhow, another great thing about being so wired in China (other than having the fact that we have an HD Production suite on the back of a bicycle), is that we’ve been able to use the internet (thanks to my wireless plan from China Unicom) in any number of strange places including; the airport, cabs, hotel rooms, side of the road, mountains, boats, buses, trains, and in a rickshaw once! The other great thing is that we’ve been able to keep up on all the happy, optimistic headlines coming out of the United States, as well as stay in touch with our loved ones. 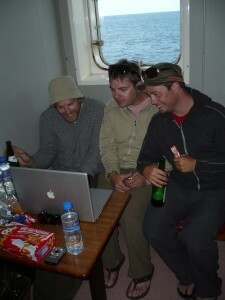 We’ve even discovered Skype and various video chat services to stay connected with those back home. So long ago…”Teching Out” in Seattle at the beginning of the trip! Putting up a blog post from the bus! 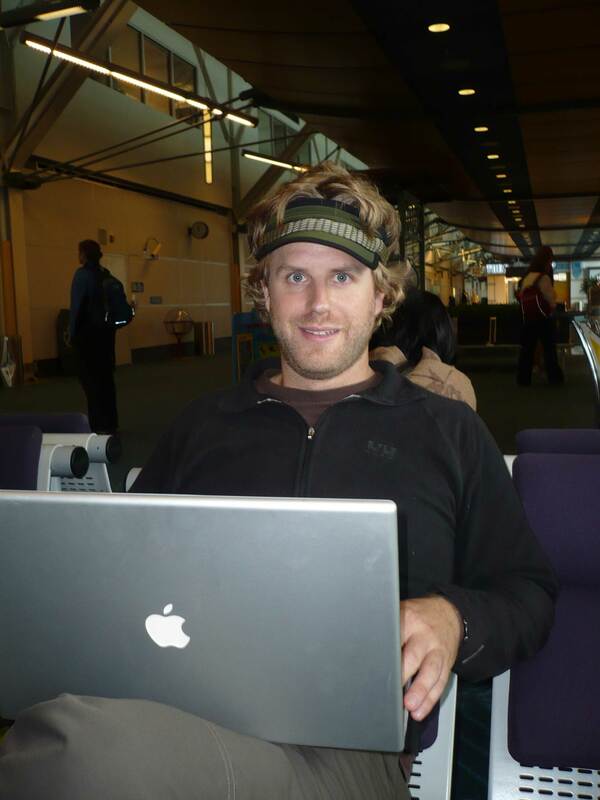 No joke, as I’m writing this post I just found out that my sister had her baby, Sam….My dad just sent me an email….Really, I’m not kidding…I just started a Google chat with my dad…I’ll have to get this post up later…. Sometimes all you need, however, is just paper and a pen! Mission Accomplished: 1,000 miles on the road! 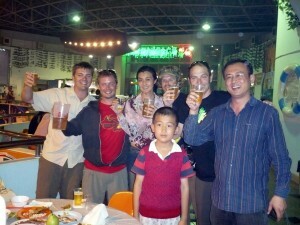 Team Man Zou in Shanghai...Time to celebrate! 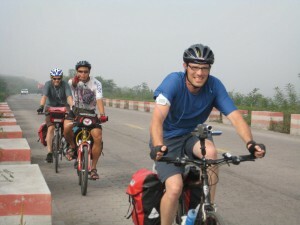 I’m proud to say that after cycling over 1,000 miles team Man Zou has made it to Shanghai. 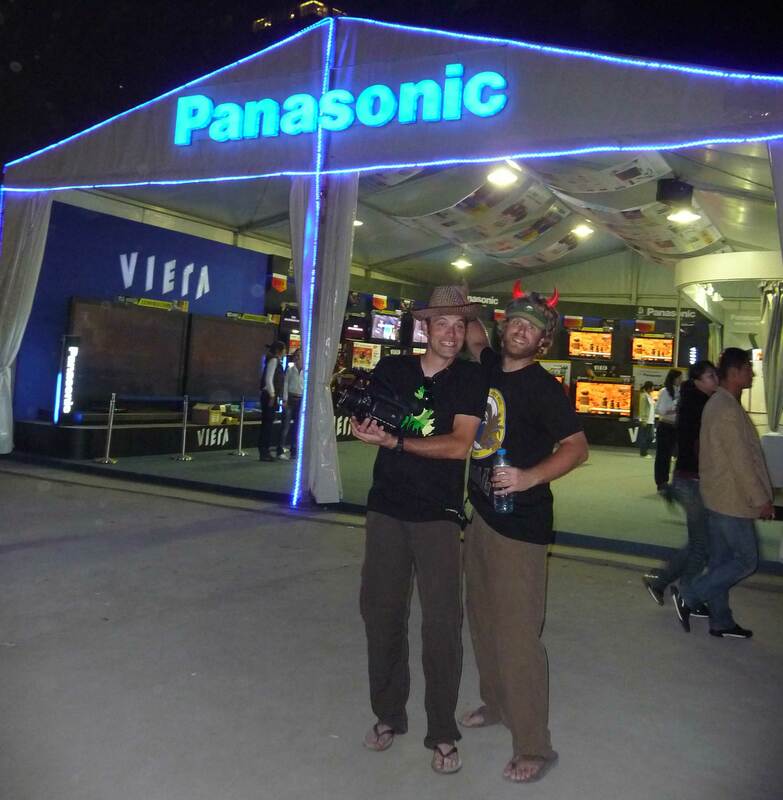 Sorry for the delay in updating the blog, but have been busy recuperating and celebrating our accomplishment. The Grand Hyatt Shanghai: The tallest hotel in the world! The past four days of cycling leading up to the completion of our adventure turned out to be some of our longest and most difficult of the entire tour. I could tell that the hundreds of miles of cycling and weeks of being in the saddle were finally starting to take its toll on both our mind and body. 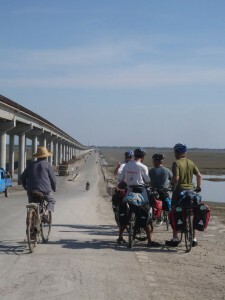 We averaged about 70 miles a day on some extremely long, straight, never-ending roads that were neither interesting or exhilarating to cycle. 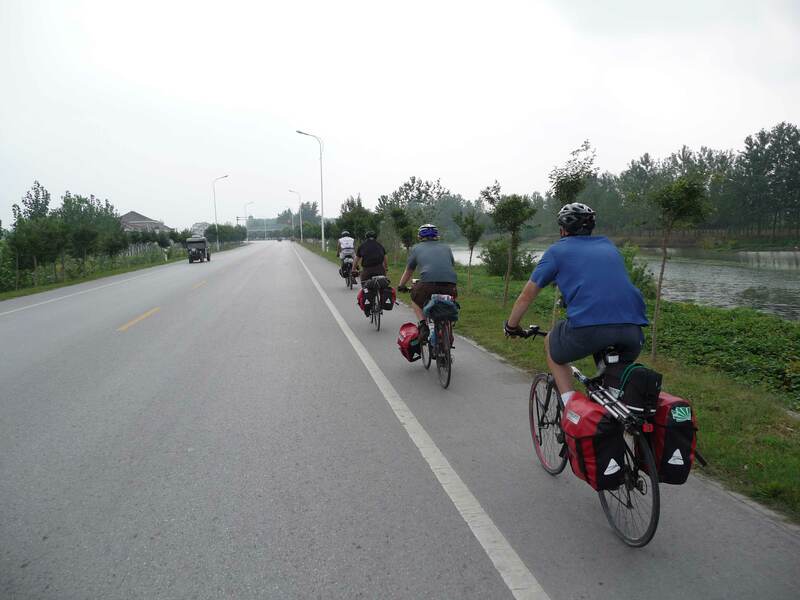 We also road along miles of beautifully paved, tree-lined corridors set aside China’s grand canal that was bustling with river traffic. Still we had our goal in sight which continued to keep everyone extremely positive and excited, even when faced with some pretty heavy headwinds or another one of our nauseating breakdowns. I’m extremely proud of how our entire team has come together over the past for weeks and immensely proud of our accomplishment. We did it! Great job Guys! 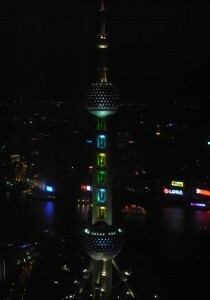 Shanghai is electric and the hotel has been absolutely amazing with it’s spectacular restaurants (sushi! ), pool, hot tubs, workout facility, climate controlled rooms, and down comforters! The view from our room at the Grand Hyatt. I have to admit that this beautiful 5 star hotel is quite a contrast to our previous 27 days of riding that led us through some extremely rural parts of China. What a way to conclude our journey. Really? Is it really necessary for the drivers in China to utilize their horns in such a liberal fashion. I have been trying to understand what warrants the use of a horn in China and this the formula that I believe they use. Honk at anything and everything. If a car is blocking an intersection; honk your horn. If a pedestrian is walking on the sidewalk; honk your horn. If it’s a beautiful day, honk your horn. If it’s a cloudy day; honk your horn. Reidster and Kevin on one of our three final ferry rides on the last day of the trip. If you had eggs for breakfast; honk your horn. If its monday, tuesday, wednesday, thursday, etc., honk your horn. If your happy, sad, grinning, frowning, left handed, right handed, a man, woman, green, red, up, down, around, whatever……. HONK your horn! Its enough to drive you crazy (and it almost did many times). Just had to get this off my chest. 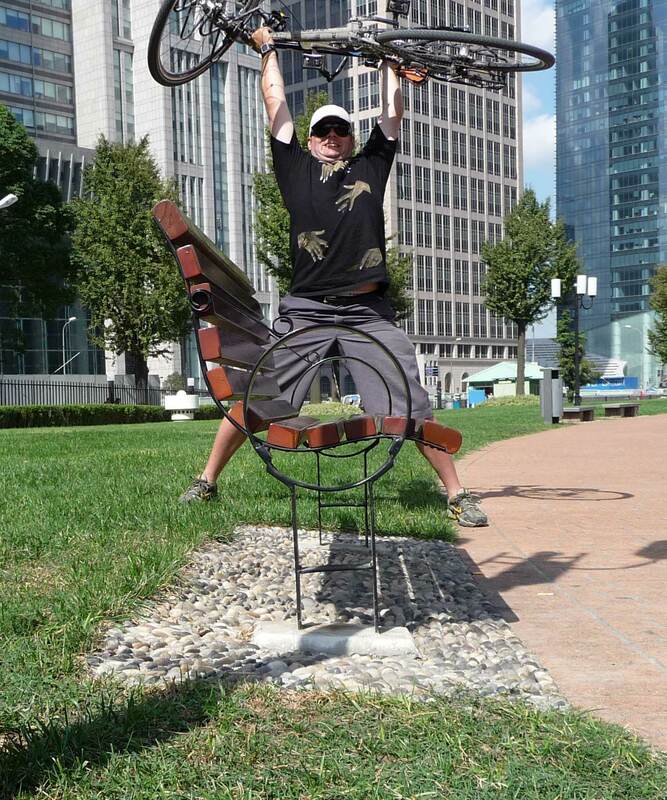 Sean celebrates riding 1,000 miles, cycling 30 mi around Shanghai the next day to make up for when he had to catch a ride earlier in the trip. A side note. 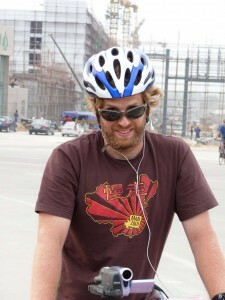 I was able to cycle the entire distance (1010miles) from Beijing to Shanghai without a single flat tire, broken spoke, or any real breakdown. Thanks Norco! 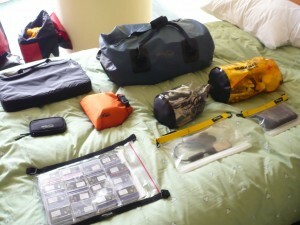 Shanghai or Bust: Over 3 weeks on the road! 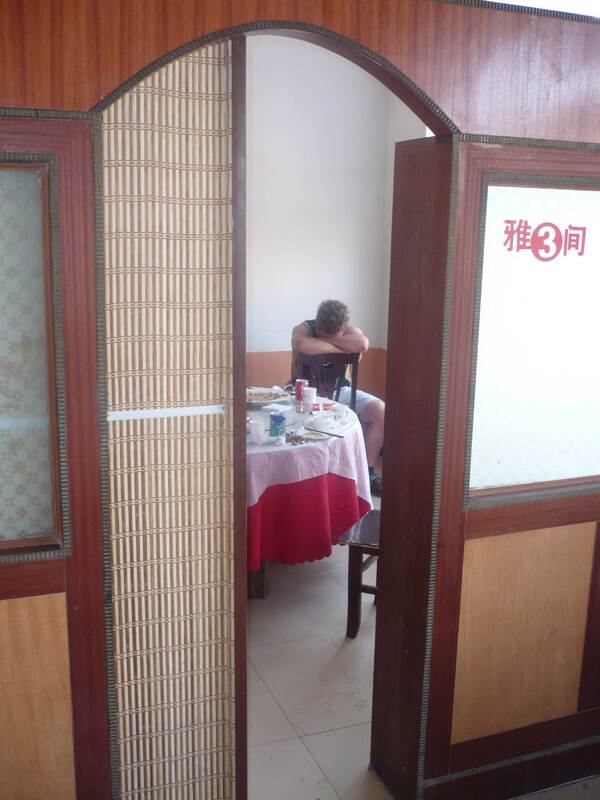 After a late night and a long morning of riding...Kevin falls asleep at our lunch stop. But with less than a week of cycling left (and only 250 miles), the end is finally in sight. Although this has been an amazing adventure, I think we are all excited to get to Shanghai and see what the city and the Grand Hyatt (Thanks Kevin!) have to offer. The road ahead...250 miles remaining. Right now we are in a small county town located on the Grand Canal, the largest man-made waterway in the world. 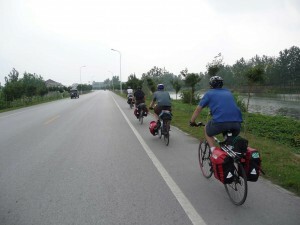 Our cycling these days consists of heavier mileage, but much easier terrain. The mountains are gone now and the road is long and flat. It’s a straight shot to Shanghai from here down the beloved 204 (the road we are going to be traveling on for the next couple of days that runs parallel to the Grand Canal). So without further ado, I wanted to make a blog post recapping some of the events not reported in last week or so. Since the ferry ride from Dalian to Yantai, we’ve had a great time checking out what the East Coast of China has to offer. 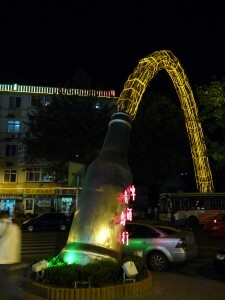 Of course we told you about the Beer Festival in Qingdao, but we were able to see a lot of other cool things there including the famous Beer Street (home of the Tsingtao Brewery) where we ventured off from our guide and ate an interesting meal containing some mysterious food picked out by Kevin and I (the menu was in Mandarin!?). 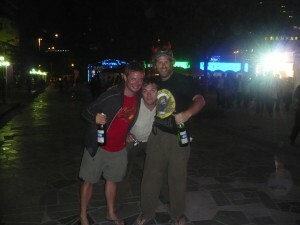 And no, if you’re thinking that beer was the only thing on our agenda in Qingdao, that’s not the case. It’s just that when cycling as much as we have, we become quite parched and work up a thirst…Plus things were just so festive here with everyone on vacation celebrating National Day. Sunset from the Olympics venue...Isn't it beautiful? 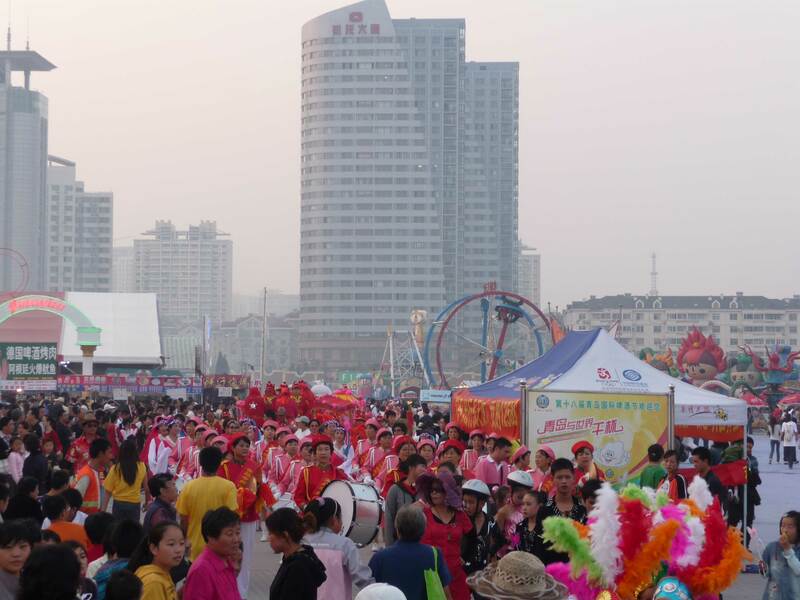 In Qingdao we were also able to explore all over this amazingly beautiful city on the coast including visiting where the Olympic boating events were held. We were also able to take a small boat ride across the bay on our way out of town, which gave us a different perspective of the city. 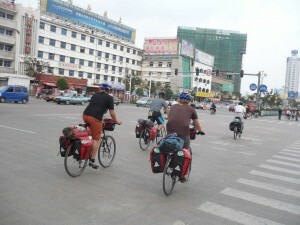 Since Qingdao, we have been cycling hard and making our push towards Shanghai. 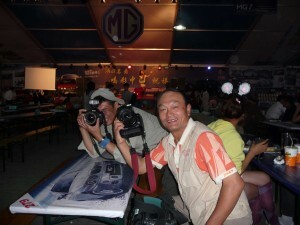 Leaving Qingdao...Team Man Zou capture the moment. One thing we haven’t talked about is how wild city riding in China can be. Entering into the cities and towns that we have been staying in is always a challenge as we have to weave in and out of traffic and ride in some occasionally precarious situations (more to come on this in Ian’s next post, Game of Death). 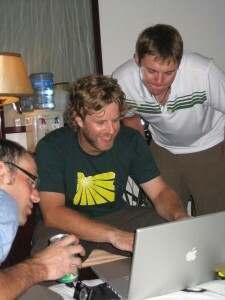 This picture doesn't represent the craziness, but the film will...Coming June 2009! I actually enjoy this part of the day for two reasons. First, I’ve made it kind of a game and even amidst all the craziness, there does seem to be a flow to the way people drive here (although if I had to explain it, that would be impossible). Second, it means we are close to our hotel for the night, so rest awaits. "I can't wait to get back to the States to eat some pizza, but for now Chinese baked goods will do." 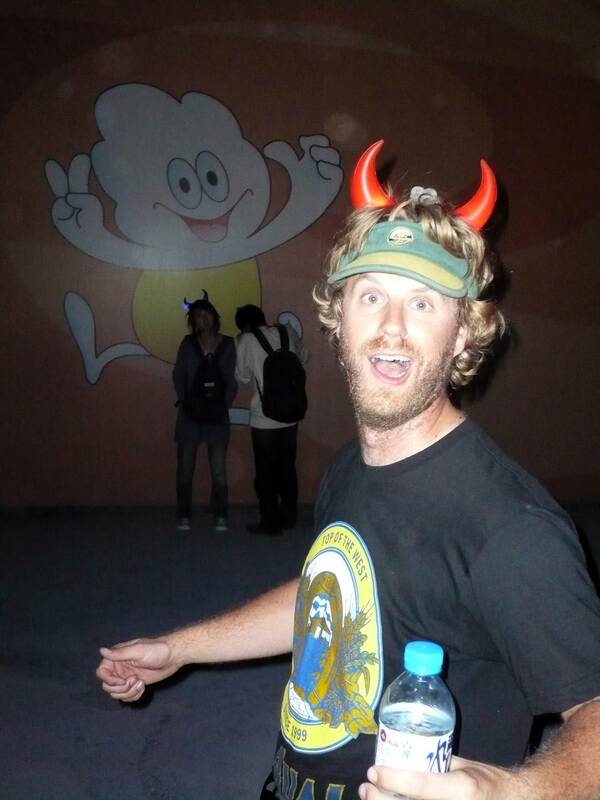 On the other hand, this is Sean’s least favorite time of the day as he gets frustrated following our guide’s lead sometimes (he’s very comfortable in this crazy environment and takes some risks that most of us don’t). 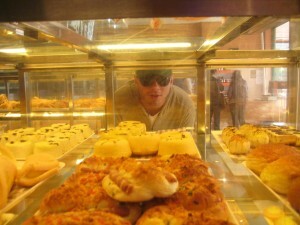 But after a trip to the bakery for some sweets, he usually calms down. Overall, I think we all wish we had more time to spend in the cities that we’ve been staying, but usually we’re pretty worn out when we arrive. Usually we have to find the hotel, unwind from the day and clean up, do our daily interviews, eat dinner, transfer footage…before we can even think about checking out the city. And of course we need to blog and get our rest before the next day of riding. But I’m not complaining…this all comes along with making a film from a bicycle, but I think we all have a list of places we would like to come back and explore on a deeper level. Reidster and Doven worked vigorously to pump up my tire...Kevin and the crowd that has assembled watch with intense interest. Last, I officially tied Sean in the battle of the broken spokes (4-4) by getting two more today. Since Sean bought new rims, I’m probably going to win (or lose depending on how you look at it) before this trip is over. I am carrying a lot of equipment on the back of my bike (more to come about that in my next post, “Teching out in China”) and I think it’s finally starting to catch up with my rims. On a separate note, however…. 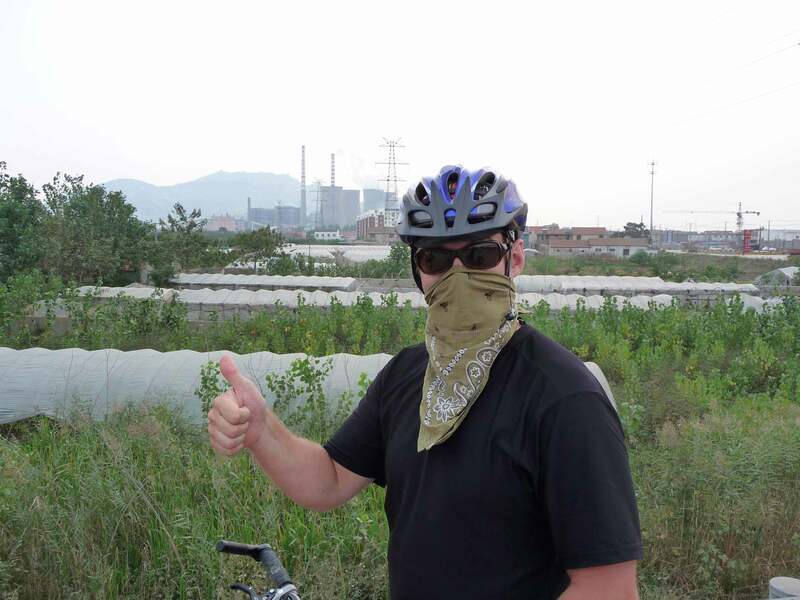 Sean sports an Ex Officio bandanna to protect his lungs from the fumes in the air. But just in case you were worried about our health (being surrounded by all this pollution), we wanted to put your mind and easy and show you that we’ve been protecting our lungs. 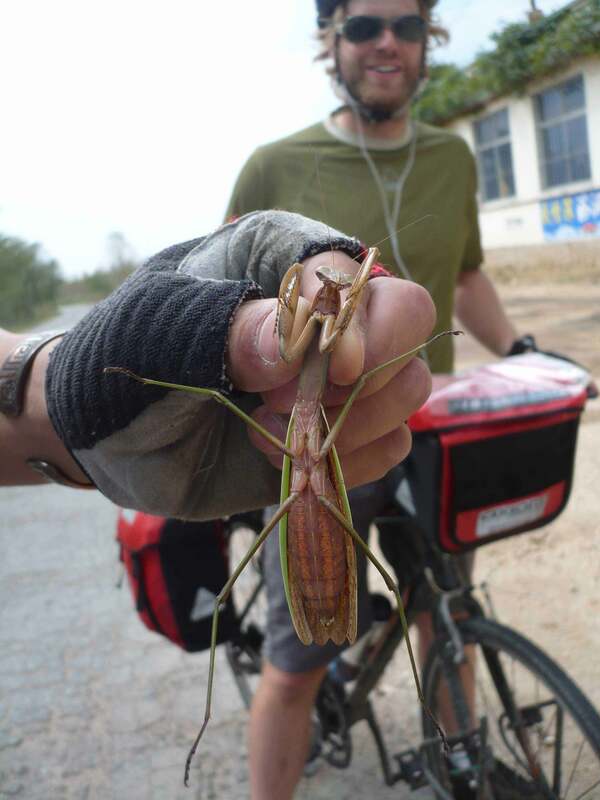 Once again, I’m up too late again writing on the blog, so I’m going to have to call it a night, but check out this last picture of a mantis picked up by Doven on the side of the road. I would never touch that thing! 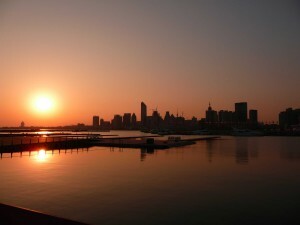 Everyday we get closer to our destination…Shanghai. The last couple of days of riding have been grueling. The mileage isn’t bad, but the pollution is getting worse as we get closer to Shanghai, the congestion on the roads is intensifying, and the noise is getting unbearable. The combination has made for some challenging riding. On the road we have averaged between 15 – 19 mph, which is really fast for us. 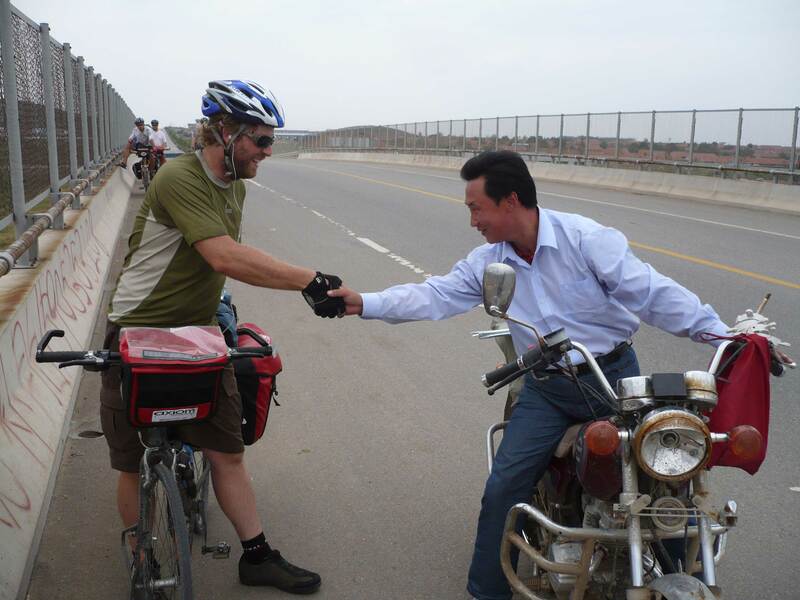 Yesterday, we had the pleasure of meeting our first Chinese cyclists on the road. 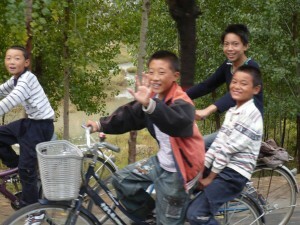 Fellow Chinese cyclists showing their support. It was really cool to meet the local bike riders. 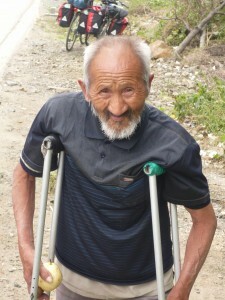 One helped me pump up my flat tire on the side of the road…a very nice gesture of hospitality. We shared of travel plans and they all thought we were crazy? 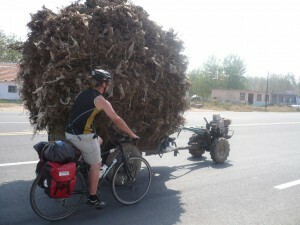 And didn’t understand why we would spend our holiday riding such a large distance? But, as they rode away…I think they thought we were pretty cool for doing such a long ride, and if they could they would do the same? 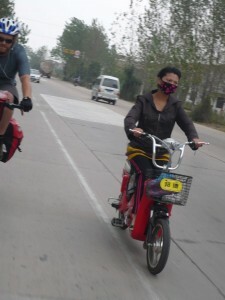 It is very common to see people wearing masks in this area of China. I also noticed that most of the Chinese riders were wearing masks…and of course we are not. Kevin and Ian groove to the sounds of the horns. The Horns…we have heard every different type of horn known to mankind. Really loud horns, meek horns, high-pitched horn, deep penetrating horns….you get the idea. There has to be some kind of horn honking system here on the roads in the China? Honk once.. to let you know that they coming closer, honk twice… to let you know that they are right behind, and a really long loud honk to let you know that they are passing? I don’t know..still trying to figure out what the need is for all this honking? Sean trying to solve the horn honking system. 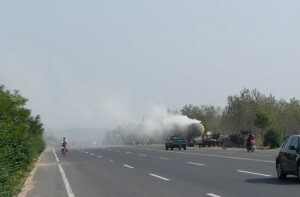 The Pollution….my favorite is when we ride past a tractor like vehicle and its is billowing out black exhaust, and as I pass..the driver shifts into another gear and a huge cloud of black soot blasts in my direction and I get a huge breath of black soot. 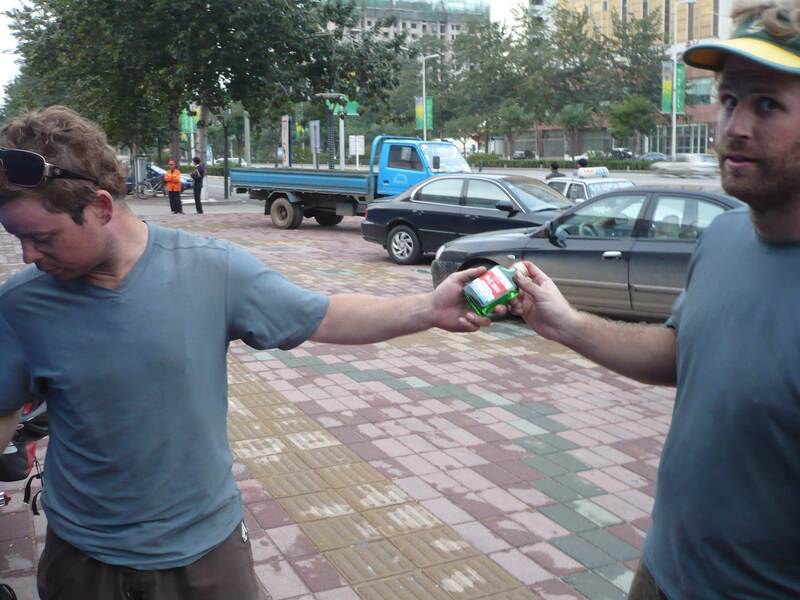 Skitching in China, Kevin gets a pull from one of the tractor-like vehicles? I try not to breath when I am passing any vehicle on the road. Yesterday we saw a overturned truck on the side of the road and they were cleaning up the spill by pumping the mess into another truck. As we passed through the huge cloud of something? No one dared to breath. "I wonder what the white stuff is?" More and more factories as we get closer to Shanghai…we were joking about how we haven’t seen blue sky in a couple of days? 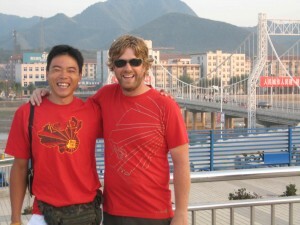 And we made bets on whether or not we would see blue skies again before we leave China. When we were in Beijing at the beginning of the ride, the skies were clears and sun was shining…upon the closing of the ParaOlympics…it was like they turned the factories back on, and let the cars back on the roads…and the skies have stayed a brownish gray. The Hello….a turn of endearment, and curiosity…I guess? While I understand that it is the only English the passers may know? Because the little Mandarin I have learned…I have learned Hello…Ni Hao. But it’s getting a little out of hand…these cars, trucks, motorcycles, and cyclists..all line up to slow down and say hello as they pass. I am just waiting to see an accident because of this welcoming novelty of saying hello to us? Don’t get me wrong…it’s very nice, and welcoming that the people even take the time to notice that we are there. The whole interaction is getting comical. 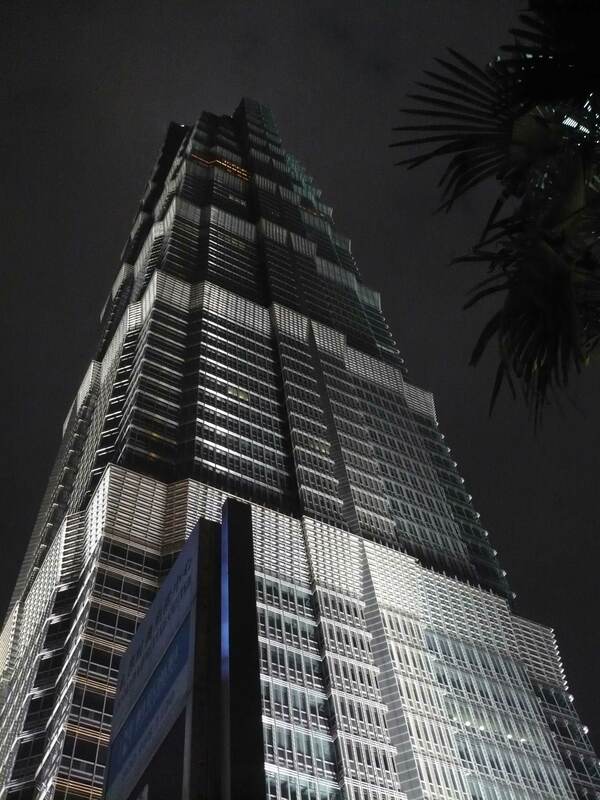 720 miles behind us, Shanghai keeps getting closer…. 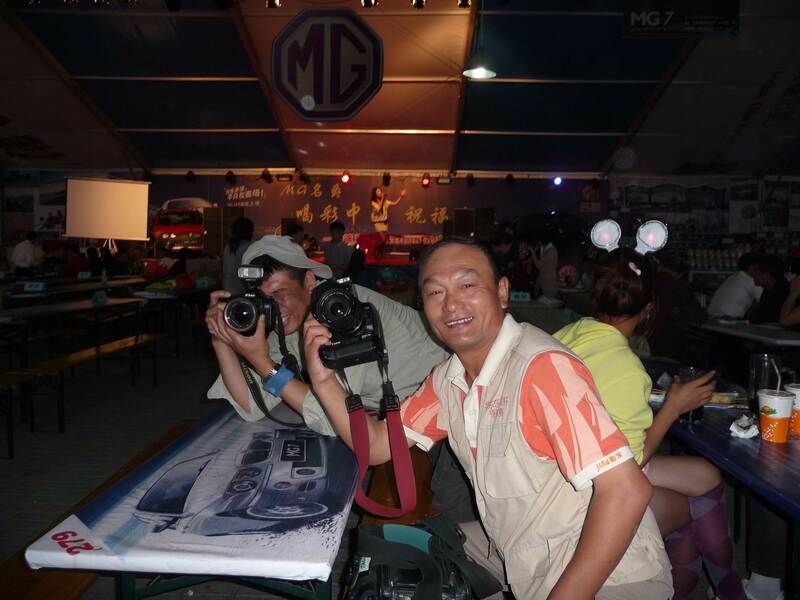 The Stars Align in Qingdao! We spent our past rest day in the bustling coastal city of Qingdao and, of course, it was also the host of a huge two week long International Beer Festival…How fitting! Not only that, it was also China’s national holiday week (Golden week) so every hotel was at capacity and the city was absolutely crawling with of people. The shopping centers were packed, all the street vendors had long lines at their booths, the buses were standing room only, every taxi that passed was occupied, you could hardly find an empty table in any of restaurants, and the beer festival saw 180,000 people (polishing off 66 tons of beer) on the first day. The Chinese people were out in force and you could feel the tremendous sense of nationalism in the air. Interesting contrast to what it must be in the states. Anyways, we made it to the beer festival where we decided to let loose, see where the night would take us, and simply enjoy this beautiful city. And where did the night take us? So funny! 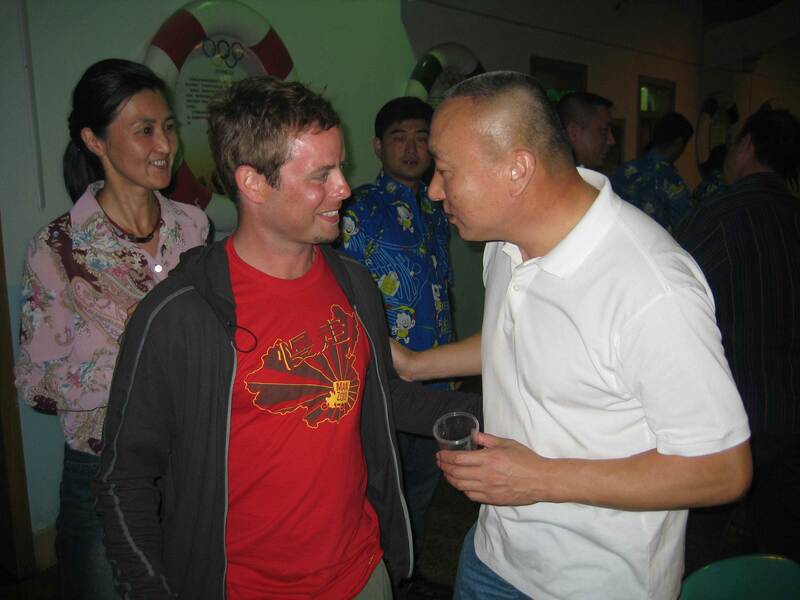 It led us to a VIP area of the Tsingtao sponsored tent where we shared beers and conversation with the Qingdao chief of police, his deputy, & 18 of his friendliest bodyguards… some of whom were passed out at one of the corner tables. We celebrate National day VIP style! The local newspaper takes our photo! 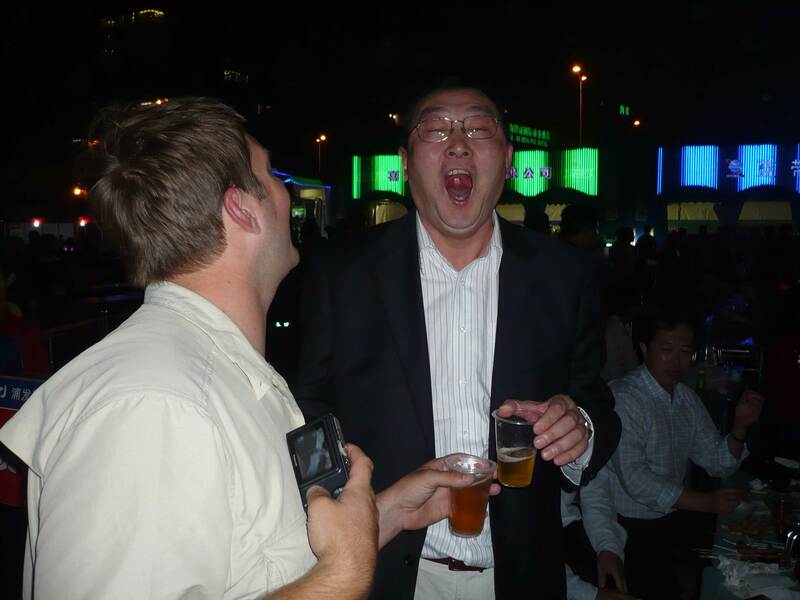 Next thing you know the entire press corps showed up asking questions, taking pics, and shooting footage of us drinking beer with all the people we had met. Kevin explaining the difference between a felony and a misdemeanor to the police chief. This was all followed up with individual interviews by both the local and national news stations that we were in prime form for. 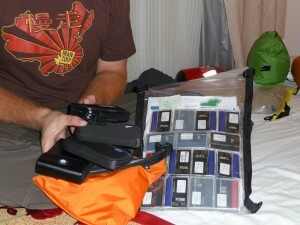 It was a wild experience and we were able to walk away with over 250 combined pics and hours of video from the event! 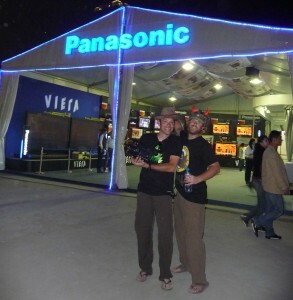 Sean immersing himself in the beers and the culture! 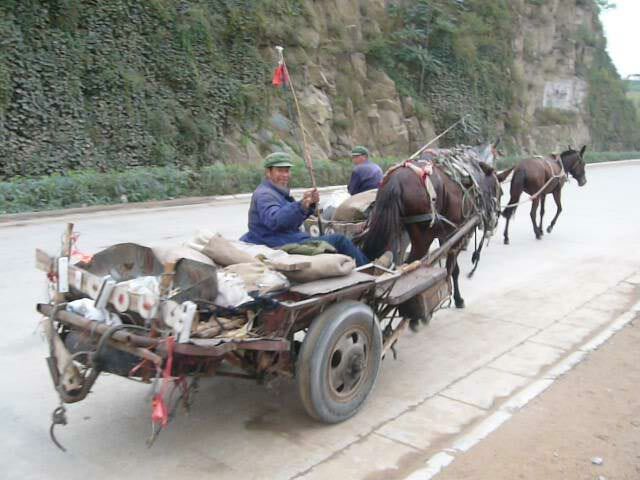 It just goes to show that anything can happen in China! Back on the road the next day for another 110k?! Halfway there…livin’ on a prayer: 460 miles on the road. 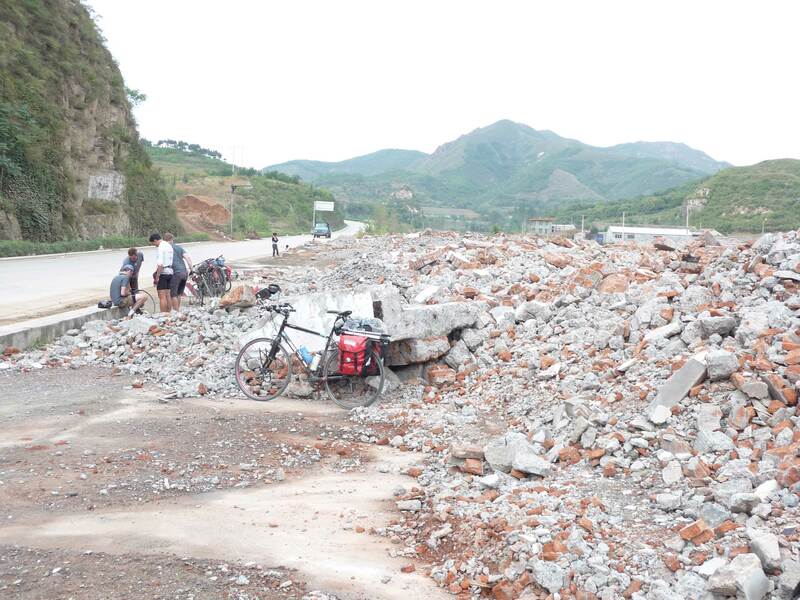 This map shows our progress on this bike ride adventure through China. 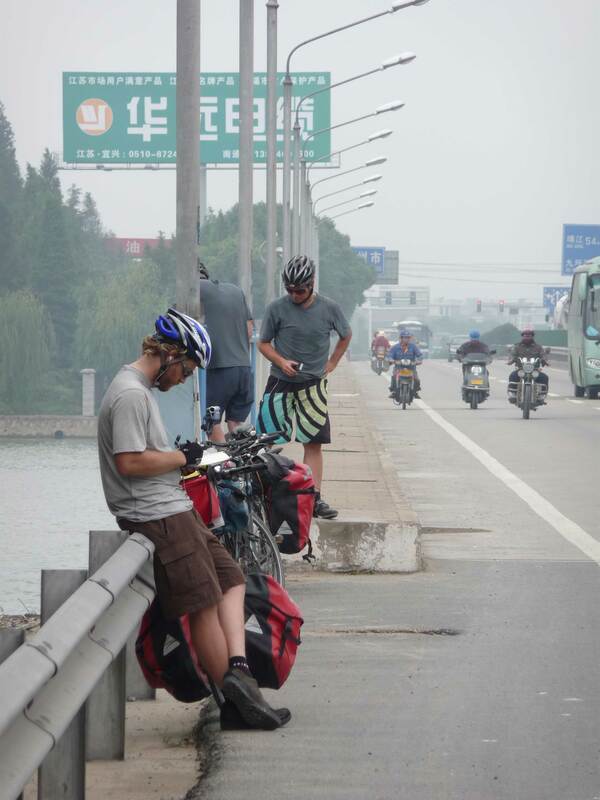 We have covered 460 miles on our bikes..roughly 800 miles more to go. The first couple of days we experienced some intense mountains, followed by some easier rolling hills. Who knows what the road will bring us next? 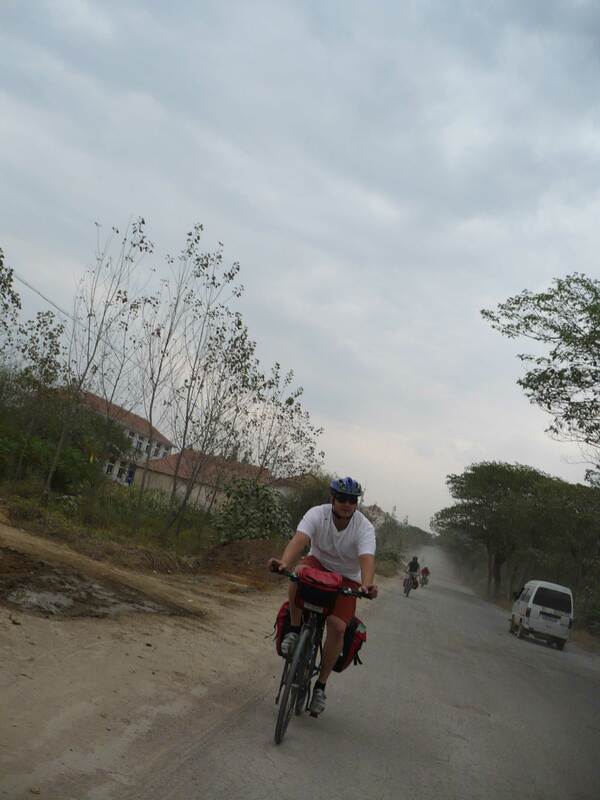 All I can say…is this bike ride has been amazing! We have been staying off of the main roadways for the most part, taking the round about routes to our daily destinations. 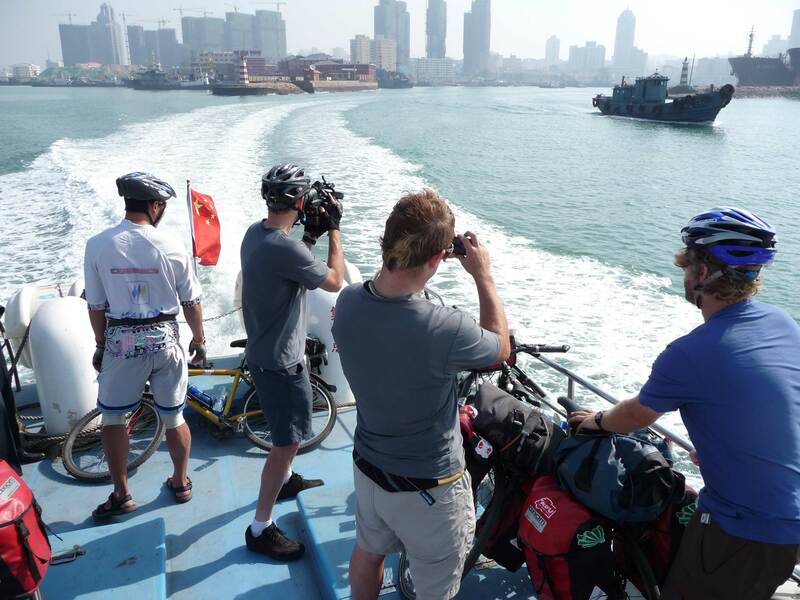 We enjoyed a couple of days off..sending our bikes ahead to Yantai…allowing us to be able to experience a Chinese bus ride and a really cool ferry boat ride, crossing the Bohai Sea. We have welcomed being back on the bikes! 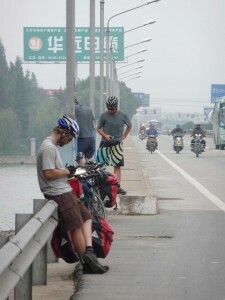 No more doddling around on other modes of transportation….strictly bicycles all the way to Shanghai. 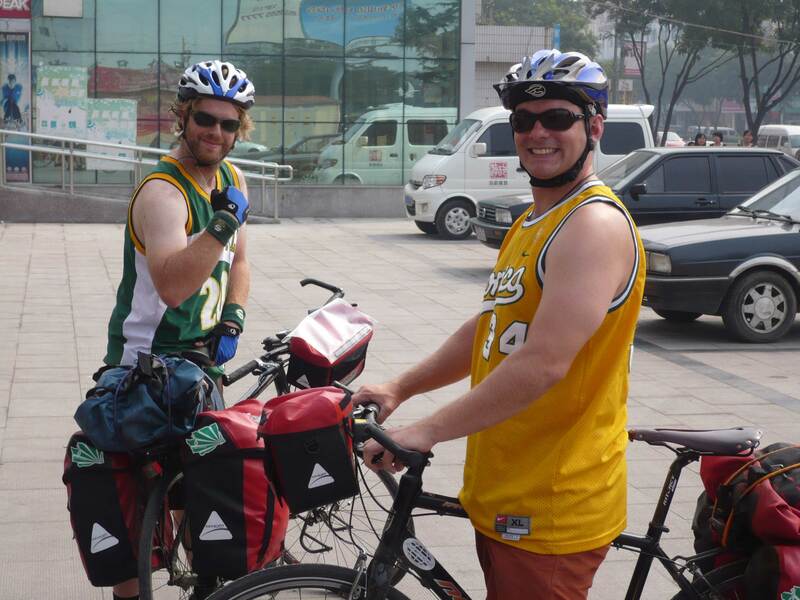 After our relaxing day wandering around the amazing city of Dalian, we are finally heading South to Yantai to catch up with our bicycles and resume our epic ride. We’ve had a few days off after completing our first leg and we’re all feeling a bit lazy (and are definitely ready to get back on the bikes). But these days off have given us a chance to “Man Zou” more than we were able to do while focusing our hitting our daily bicycle benchmarks. We’ve been able to explore some of the largest cities in Northeastern China, which has been a great experience and have had a chance to rest our weary bodies. 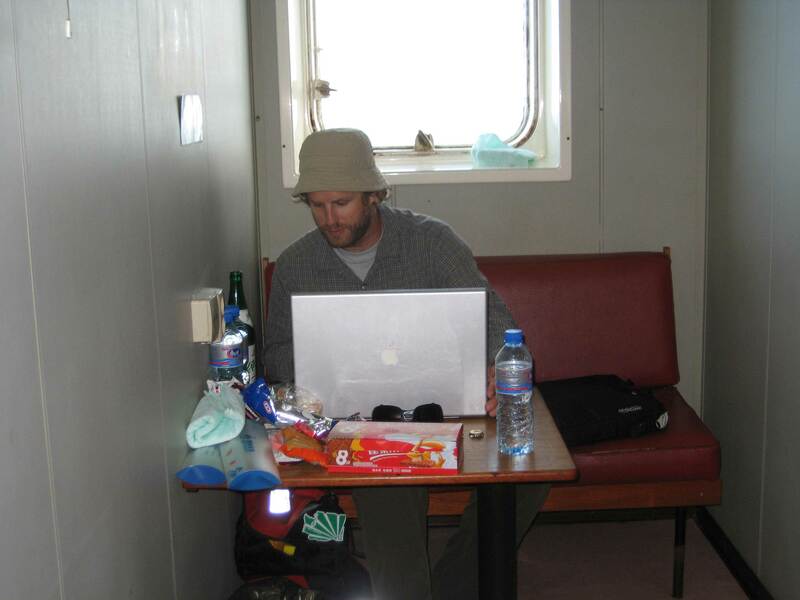 We have also finally achieved our goal of taking a ferry in China (which was no easy task) and are on the open sea right now as I am writing this latest blog post. 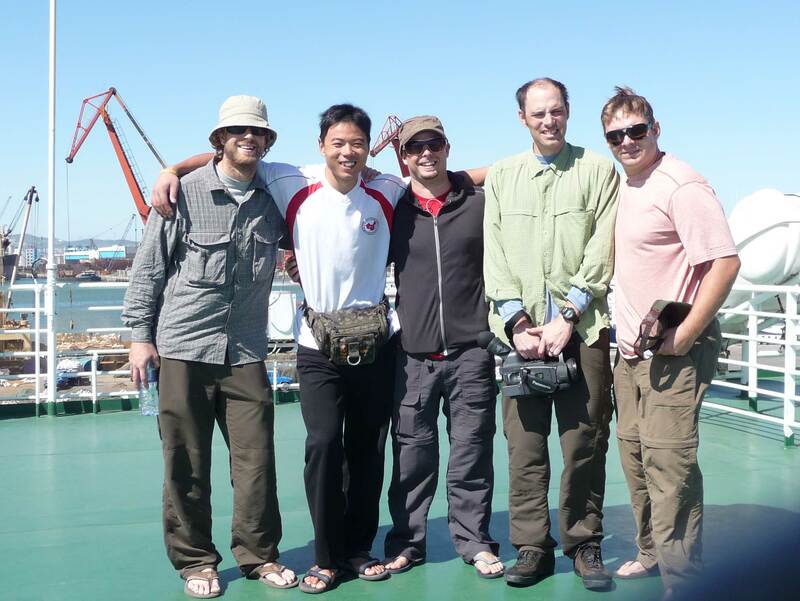 Although getting to the ferry was a bit of a struggle, once we got onto the vessel…it’s really not much different than a ferry in the United States and has been a very smooth and relaxing ride. We decided to splurge a little and get private rooms (mostly to make sure our equipment, etc was protected) and it’s absolutely gorgeous today…sunny and 75 degrees. 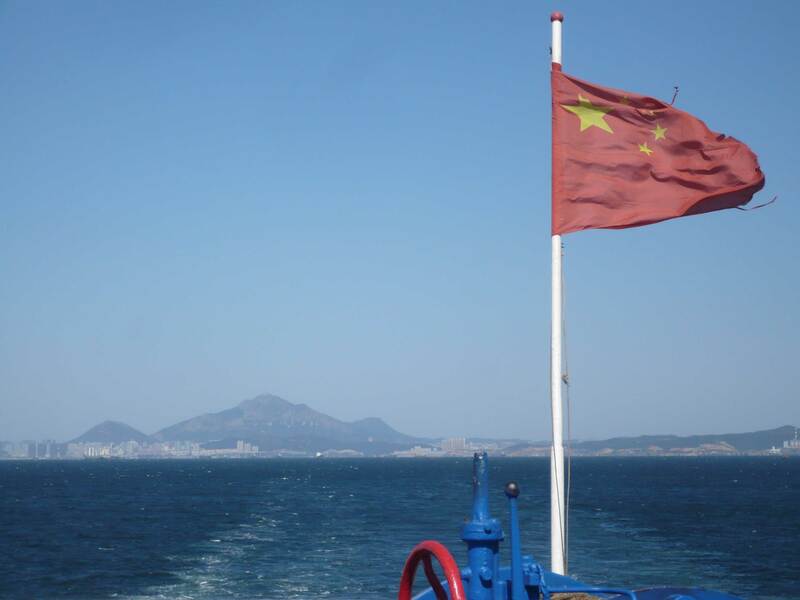 The ferry ride will take about 7 hours to get to across the Bohai Sea. 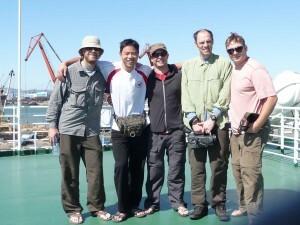 Team Man Zou on the deck of the ferry as we sail away from Dalian. 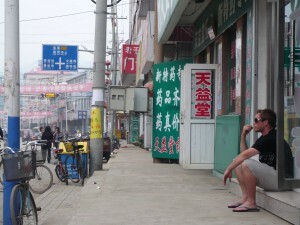 Leaving Dalian really gave us a better perspective of this rapidly changing city. As we pulled away you could see not just one major development like the one we walked around yesterday (more to come about this soon), but many others that were just as big or larger located across the massive shoreline…We were also able to get a better look at the vast industrial center and ports as well. It’s clear that in the future this is not only going to be a major tourist/vacation destination, but also a large metropolis with unlimited growth potential. 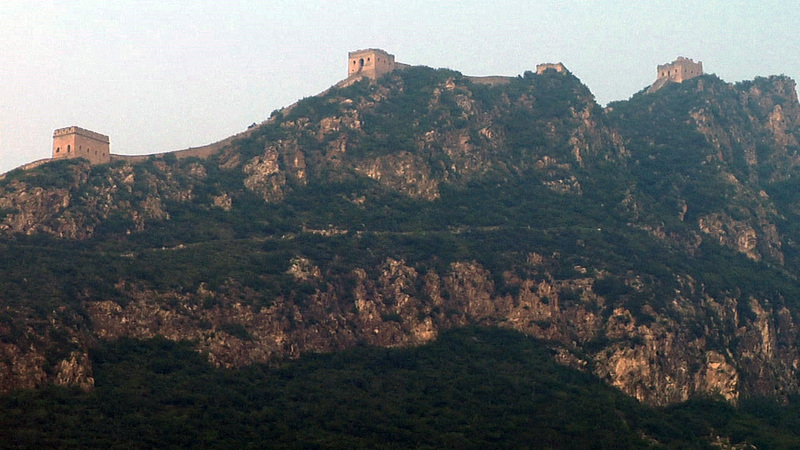 The fact that the city of Dalian was only built in the last hundred years (and most of the major development in the last 10) blows my mind and I’d love to be able to see what this place looks like in a few more. As we head South on the ferry, Dalian disappears into the horizon. 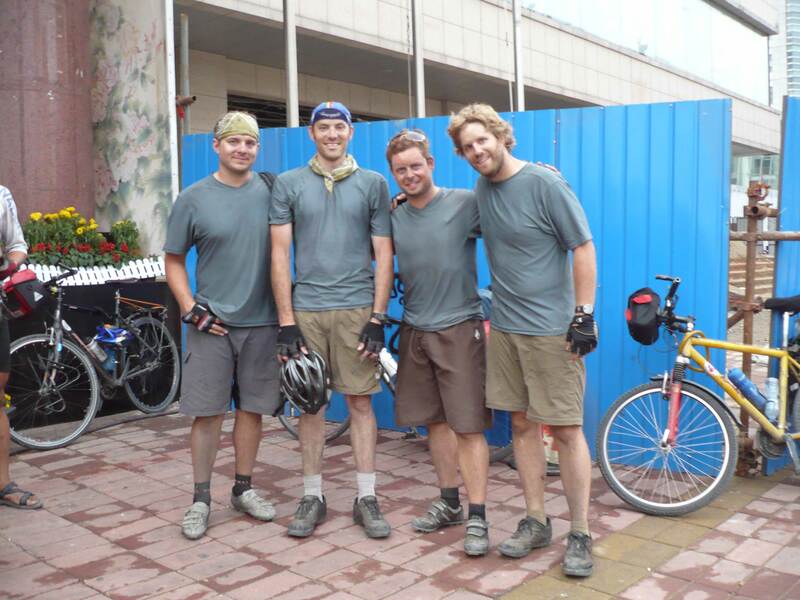 Now onto to Yantai where our bicycles are hopefully awaiting in one piece. We will leave tomorrow and cycle 4 days along a pennisula to Qingdao, our next rest day destination and home of the International Beer Festival (which we’re all looking forward to attending). 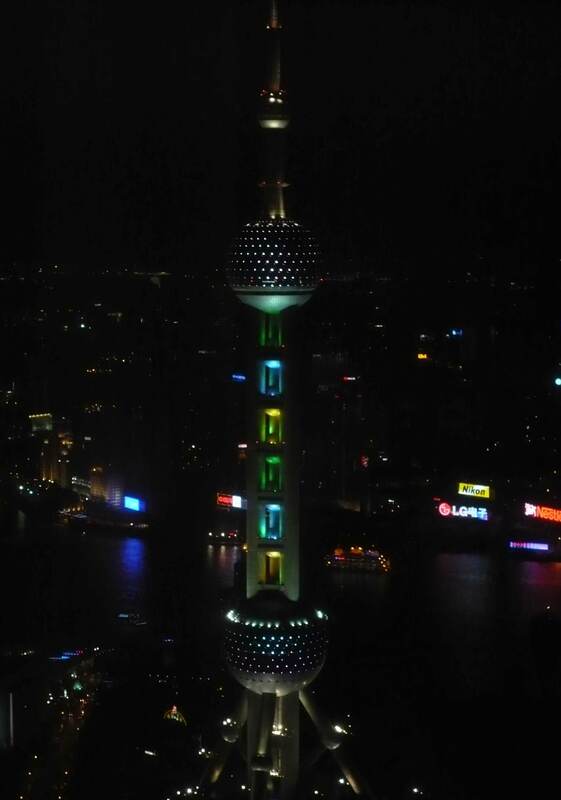 We also getting closer to National day (October 1st) and the beginning of vacation for a large majority of Chinese. Needless to say, we’re all interested to see what that experience is going to be like as well. That’s all I got for now…I’m going to head up to the deck to bag some rays now and make the most of this amazing ferry ride. Kevin and Sean help me choose some pics for the blog post from our stateroom! 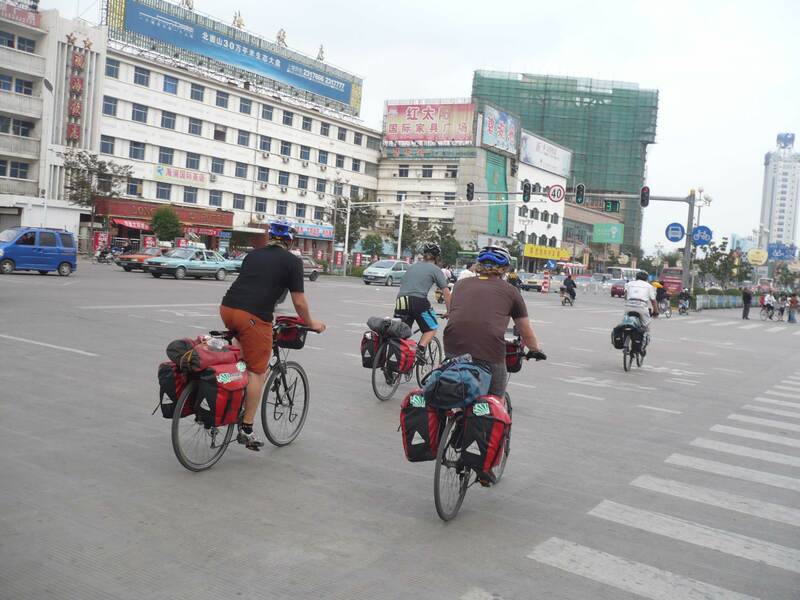 In order to achieve our goal of taking a ferry across the Bohai sea to Yantai, we had to ship our bikes ahead and take a 7 hour bus ride North around the coast to the city of Dalian. 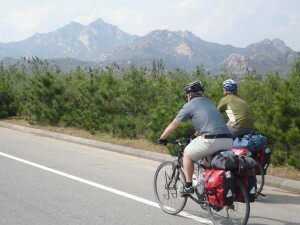 It is in a completely different province of China (near North Korea) and we are eager to see what the next turn holds (and excited to get a small break from riding). 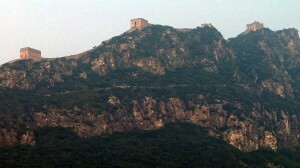 We had a great day off in Qinghuangdao yesterday where we were able to walk on the Great Wall for the first time. 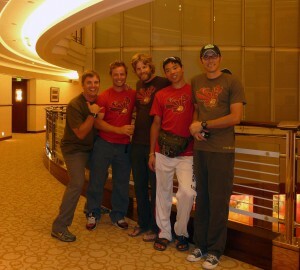 Unfortunately, we decided to give our guide a rest for the night and hit up the KFC in the bottom of our hotel. Now first off, we haven’t ate anything other than authentic Chinese food this entire trip, but with the first leg under our belt, we were all craving a little American comfort food, particularly french fries. With as many potentially sketchy foods we’ve encountered and eaten over the last week, nothing had the negative impact that the KFC had. Let’s just say it didn’t exactly settle well with us and we’re definitely going to stick with Doven’s suggestions from now on (he tried to steer us away from the KFC). But looking ahead, we’ re going to have a day to wander around city of Dalian before our ferry ride and meeting back up with our bicycles. 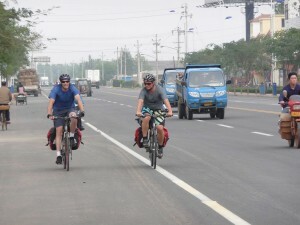 Although the bus ride is a little rickety, it yet another new experience traveling in China and we are very much looking forward to getting back on the bicycles (once our bodies have had a chance to heal). We’ve heard the Dalian is less polluted and our lungs our looking forward to that as well. But overall spirits are high and we’re really starting to adjust to life on the road here in China. That’s all I got for now as there’s no telling when the internet might give out on this crazy bus, but here are a few choice pictures from our adventure to keep you entertained. Hope all is well in your part of the world! Treated like rock stars in a small town we visited, the owners of the restaurant hired a local photographer to document the experience. 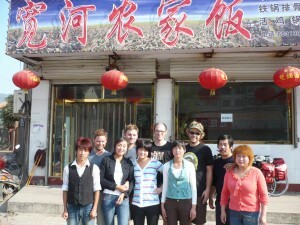 Needless to say they hadn't seen many foreigners in a LONG time! We like to change our route a lot, which has caused a few headaches for Doven...But he enjoys the spontaneity of Team Man Zou! 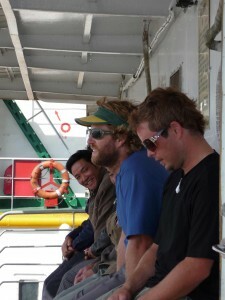 Sometimes the locals enjoy riding alongside Team Man Zou! 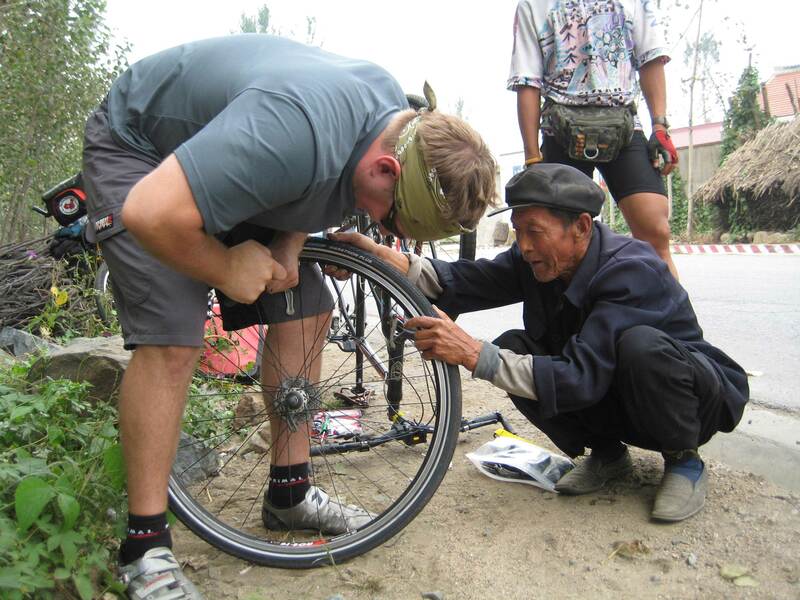 Collecting bottles and other treasures alongside the road, a local stops to check out one of our wheel repairs. Riding into the Qinghuangdao, Kevin and Sean take a break from the pollution to pose for a picture. Another interesting roadside picture in China! 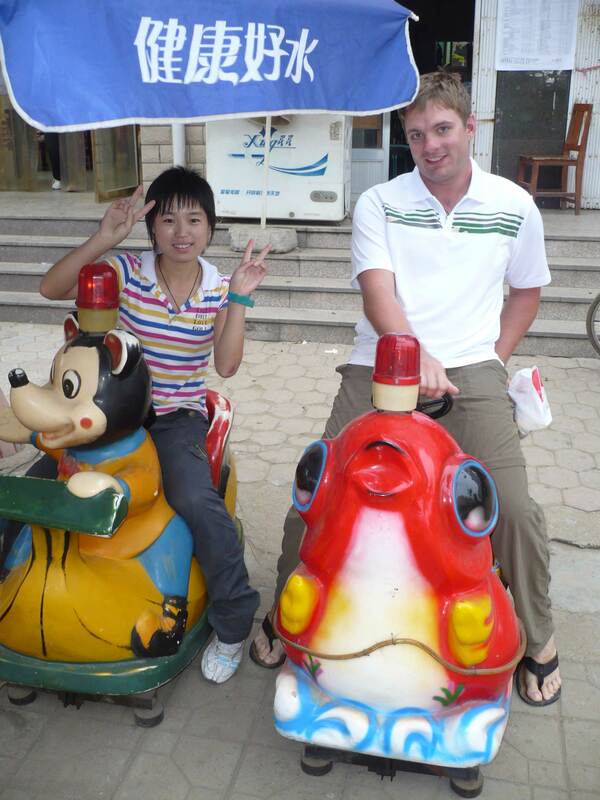 Sean meets a new friend in Qin Long, who shows us around her city and helps him find a new shirt to buy. 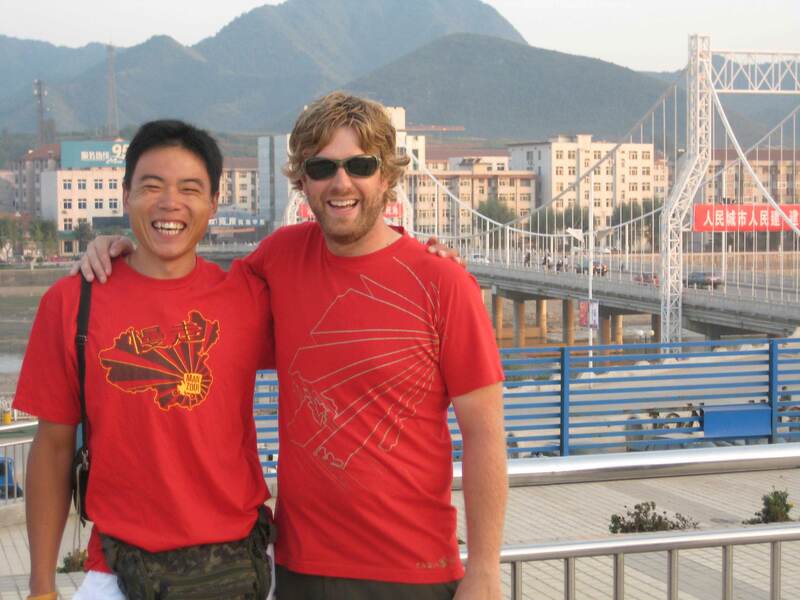 Doven and Reidster, out for a stroll along an empty riverbed....Check out the cool Man Zou t-shirt! 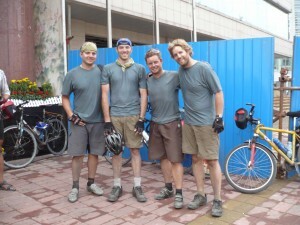 After riding into Qinghuangdao, let's just say we were a little dirty from the conditions here! So we’ve officially finished the first leg of our journey….reaching the coast of China after bicycling nearly 400 miles from Beijing. 8 days in, despite many trials and tribulations, we’re all still alive and team Man Zou is stronger than ever. Over the last couple of days we’ve experienced a wide range of challenges that have tested us on new levels, but I am proud to say that up to now, we’ve passed with flying colors….but here’s a little breakdown of all of our breakdowns. 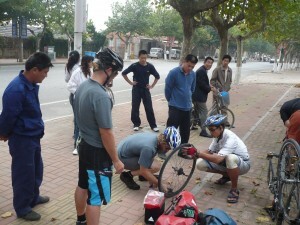 In China, when your bicycle breaks down, it's only a matter of time before the locals come to rescue! One of the problems we’ve run into is broken spokes. This has caused us numerous delays and lots of fun! 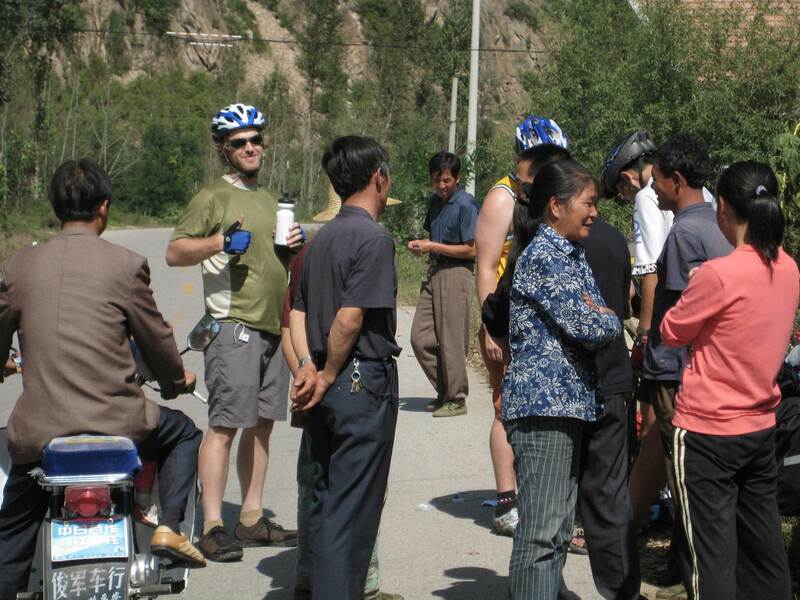 Within a few minutes of each breakdown, the locals will swarm around us, curious as to what we are doing in their small towns with our strange bicycles. Most of the time they stand around and gawk at us, but they always offer much needed moral support in our time of need. Occasionally, they even help out as they are very resourceful people. 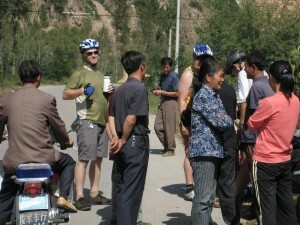 Sean has been particularly receptive to getting help from the locals. He enjoys the crowds watching him as he tries to repair his bicycle. Back on the road, ready for more riding! Since we’ve started working better as a team, we have been able to fix our bicycles much faster…which allows for more time to ride up mountains! But with every breakdown, it seems like Team Man Zou gets a little closer, even in the most dire of situations. Sure, we might taunt each other a little along the way, but it’s all in good fun! Today we arrived in Qinhuangdao after an extremely challenging and dirty day of riding….But overall spirits were high, despite how crappy our lungs felt from all the pollution here. After a long day of riding, nothing caps it off like a taste of the White Lighting! 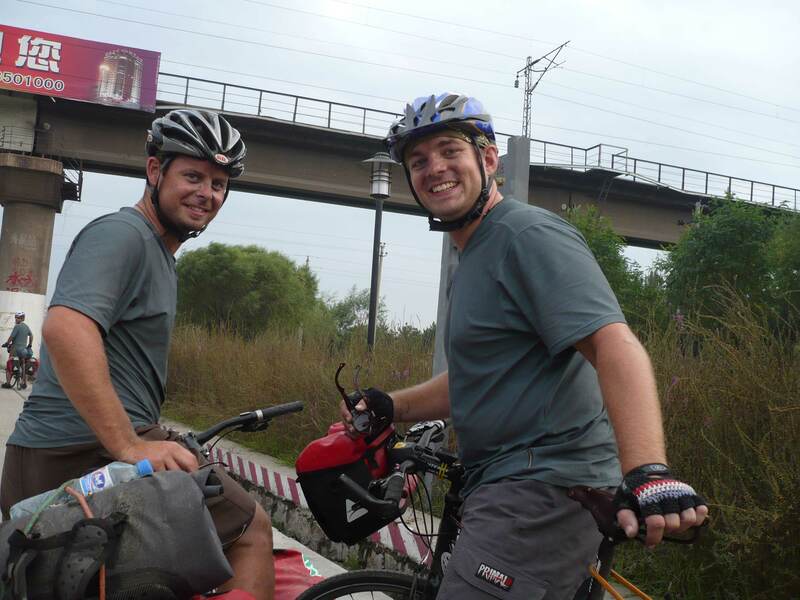 We are looking forward to seeing the Great Wall tomorrow and having a few days off from cycling as we have to send out bicycles to Yantai in advance of our ferry ride. More to come soon, but now it’s time for bed. Team Man Zou arrives in Qinhuangdao...Is there an Ocean here? 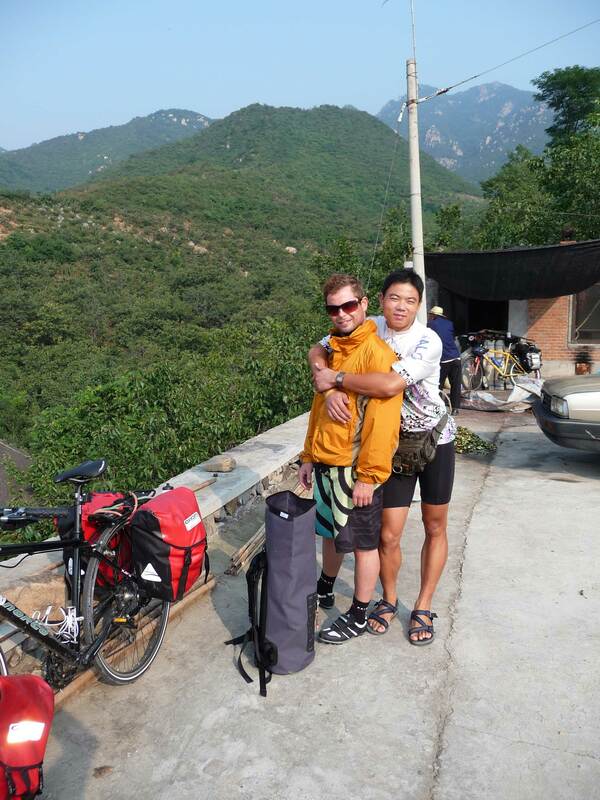 Actually, it was two days ago that we made it to athis epic location below a section of the Great Wall. It was called Simatai and although the resort was very touristy we were able to enjoy some of the comforts we all left in the states. Jason was able to order up a dainty looking espresso, Sean was able to find some ice cream, Ian was able to take some long undisturbed shots, and I was able to have an ‘icy’ cool cerveza. It was an absolute pleasure sitting around with the team chatting about our experiences and reactions to the tour with the Great Wall in the distance at sunset. Surreal! What were they thinking building a wall on top of that mountain! One of my favorite experiences over the past week has been learning about and getting to know our terrific tour guide Doven Lu. 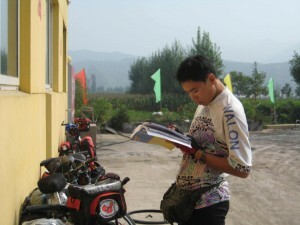 He is a young energetic fella who shares the same love for cycling as I do. 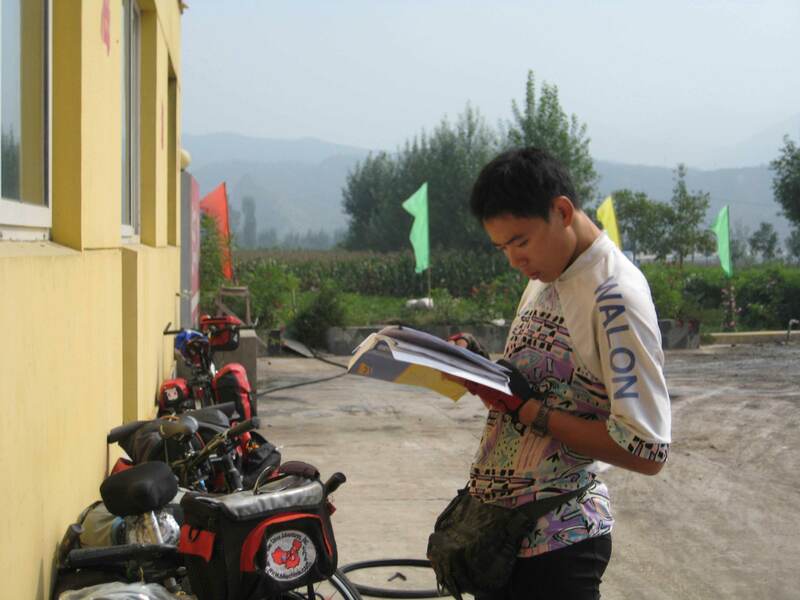 Doven always says, ” I want you to enjoy the cycling,” and that’s what we are able with him guiding the way. Doven translates, schedules, makes reservations, finds us water, checks into hotels, teaches us Chinese, picks up girls (kidding), keeps us safe, and the list goes on. He told me he chose to join this tour because he wanted to “do the extreme” and added that this 28 day tour “is extreme!” He’s a great guide, a great person, and so far he is our savior. Tonight we’re gearing up for our 100 mile day that leads us out to the coast where there should be flatter roads and we hope less pollution. Oh, forcast for tommorrow is rain, rain, rain! Sweet?! Kevin takes in Qin Long!